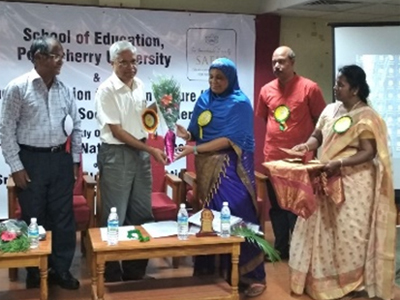 Day 1 of the workshop started with an inaugural event which was presided over by Professor S. Balakrishnan, Director (Directorate of Studies, Educational Innovations & Rural Reconstruction [SEI&RR]), Pondicherry University. A welcome address was delivered by Professor Mumtaz Begum, Dean, SOE. After the lighting of the lamp of knowledge, Dr. Sampadananda Mishra, Director, SAFIC, delivered his brief inaugural remarks, and Professor S. B. Mohanty, President, All India Association of Educational Research, gave the keynote address. A souvenir prepared especially for the workshop was also released at the inauguration. 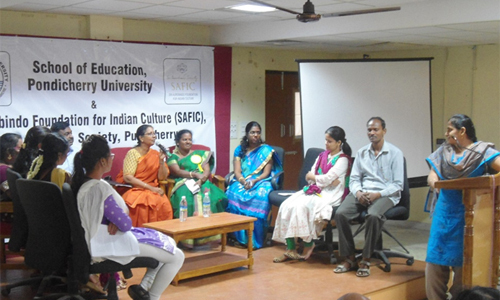 The first session titled ‘Integral Education – An Introduction’ was conducted by Dr. Beloo Mehra, Senior Associate, SAFIC. She pointed out that the current mainstream education is primarily based on an industrial–rationalistic–materialist view of human existence and life. But what we really need is an approach to education which is grounded in a more humane, holistic, Indian spiritual view that takes a much deeper view of an individual, a society, a nation and the purpose of human life. With the help of relevant examples and elaboration, Dr. Mehra explained that education, in this light, becomes a means to prepare learners for a deeper transformation and inner evolution. After lunch, Mr. Shivakumar, Director, Sri Aurobindo Foundation for Integral Education and Research (SAFIER) conducted a session on ‘Education of the Mind’. He stressed on the importance of developing our mind and its capacities as part of the education of the whole person. Through some practical exercises he facilitated an exploration of a few key questions such as: Do we really have to learn ‘how to think’? How much of our own mind is under our control? The session also helped participants learn about and explore the key powers of the mind: concentration and will; power of expression through mastery of languages; capacity of expansion and synthesis; and opening to inspiration. The significance of silencing the mind was also highlighted. The final session of the day was conducted by Dr. Sampadananda Mishra, on the topic ‘Role of Education in Nation-building’. He pointed out that Swami Vivekananda was probably the first among Indian thinkers to give a psychological and spiritual orientation to education and nation-building through his emphasis on ‘man-making’ education, which focused on building character, willpower and the power of concentration. 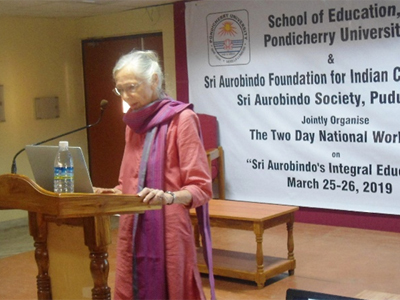 He shared with the participants Sri Aurobindo’s emphasis on the role of education in facilitating the flowering of an all-encompassing personality, overcoming the various limitations and developing the udaracaritatva or wideness and nobility in heart and mind building character which is necessary for building the nation and serving the humanity better. He explained that in a deeper sense, a harmonious and fully developed character may be considered to have four dimensions: dimension of wisdom; dimension of heroic will; dimension of compassion and universal love; and dimension of competence, chiselled skill and untiring labour. All these are necessary to fulfil the highest aims of education for character-building, nation-building and man-making. Several participants asked very relevant and informed questions at the end of each session, which made the entire learning experience more relevant and student-focused. The second day of the workshop opened with a panel discussion in which several students, research scholars and faculty of the School of Education, PU, took part. 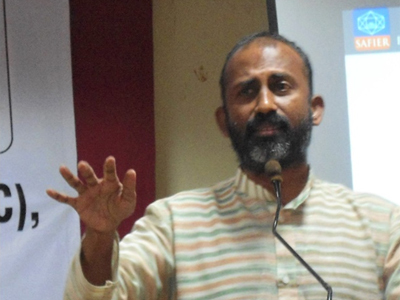 The panel titled ‘Challenges in Incorporating the Educational Ideals of Sri Aurobindo in Present-Day Context’ was chaired by SOE Professor, Dr. K. Chellamani. The panellists spoke of different challenges ranging from the large class size, lack of teacher training for implementing the practices of Integral education, societal and parental expectations and demands, increased emphasis on money-making role of education, limitations imposed by the institutional culture and preferences of the administration, etc. The chair summarized the various points brought up in the panel and opened the discussion for comments and inputs from the audience. This was a highly interactive session and brought clarity on several key points. The next couple of sessions were conducted by Dr. Prabhjot Kulkarni, an eminent educationist from New Delhi, who emphasized on the significance of creative incorporation of drama and theatre and other arts in holistic education. 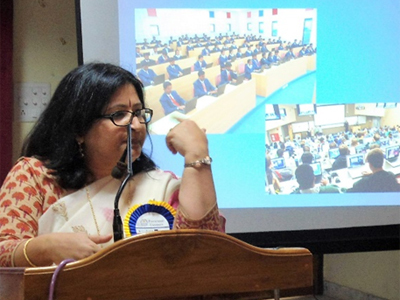 In her theoretical but a highly interactive session titled ‘Drama in Education – A Brief Overview’, Dr. Kulkarni underscored how drama as a form of play is instrumental in fulfilling many developmental tasks that education must perform to facilitate the overall development of the children. Pointing out that though musical education and storytelling were a key part of school curriculum in most ancient societies, since 1960s research has also shown how Drama in Education is powerful both as a classroom subject and a method or pedagogic tool, particularly at Elementary level. A well-trained and dynamic teacher can easily make difficult concepts more approachable for her students through drama conventions or dramatic modes, thus making children happy and joyful. The post-lunch lesson titled ‘Basic Games and Exercises for Self-awareness through Drama/Theatre’ was a highly participatory session. The workshop participants enjoyed the various exercises that involved both individual as well as group work. The use of sound, music, movement, role-play, exercises for enhancing focus, spontaneity, and creativity, and other theatrical techniques was highlighted in a fun and participatory way. The next session of the day was focused on learning briefly about some of the experiments in Integral Education that are going on at Mirambika in New Delhi. Ms. Neeltje Huppes, co-founder of Mirambika conducted the session titled ‘Lessons from Mirambika Experience’. After giving a quick introduction to the soul-guided nature of Integral Educational approach, she presented a brief history of Mirambika and shared some examples of how the educational approach practiced there helps the children to develop a well-balanced and integrated personality. She narrated a few instances where the children demonstrated a growing sense of self-awareness and also developed in the most natural and organic way nobler qualities such as compassion, love, respect and care for Mother Nature. She also showed examples of students’ drawings and other creative works. Day 2 of the workshop concluded with a valedictory session. 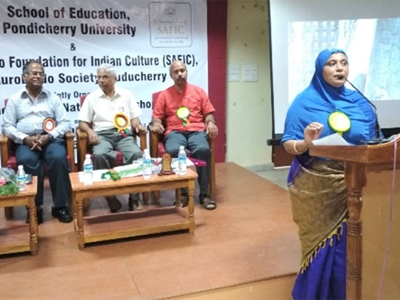 Professor Mumtaz Begum, Dean, SOE, gave a brief closing address at this session, emphasizing the highly engaging, thought-provoking and inspiring nature of the two-day workshop. 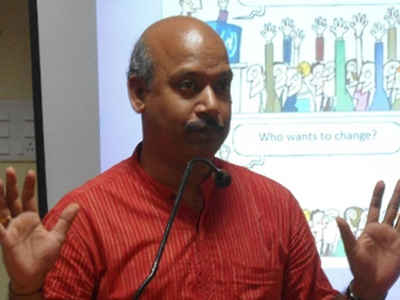 Professor Srinivas, Dean, School of Humanities, PU, presided over the session and delivered the valedictory address. He commented on the prominence given by Sri Aurobindo on the role of education in facilitating the conscious evolution of an individual, society, nation and humanity as a whole. He also spoke about Integral Education as a key aspect of the overall Integral Philosophy and Yoga as given by Sri Aurobindo. 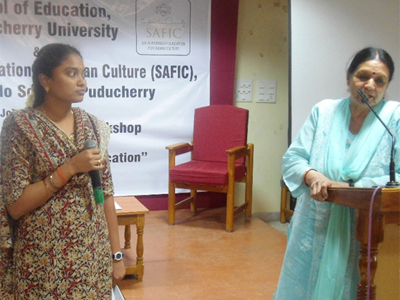 Two participants were invited to give their feedback about the workshop sessions, and briefly share with the group what key insights they had as a result of this two-day orientation to Integral Education. Finally, Dr. Beloo Mehra summed up the workshop in which she revealed how the three principles of true teaching can be applied in the personal inner work as teachers and human beings. She stated that despite the constraints of the mainstream system of education, it is important to recognize that any meaningful change begins with a change in one’s own inner attitude toward work, learning, personal growth and the role of education in general – both for the teacher as well as the student. She also spoke about the role of ideals in inspiring the individual and group mind and will to rise beyond its limitations. Participation certificates were then distributed to all those who attended the workshop. Two small books published by Sri Aurobindo Society – Introduction to Sri Aurobindo and Ideal Parent–Ideal Teacher were also distributed to all the participants.